This 26ft Custom Center Console, powered by a Yamaha 250HP four-stroke outboard, has bilingual captain Alex Zambrano is at the helm. Built in 2013, she carries a Garmin chart plotter/sounder/blue chart, and the latest in satellite technology, providing a color, 3D image of up to 2,000ft below the surface; new top-of-the-line equipment including Penn, Shimano; and Moimi high visibility braided line. 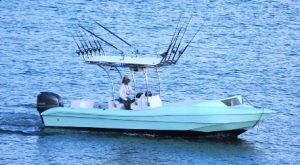 She also has outriggers built into the custom T-top; built-in live well and tuna tubes; built-in fuel tank for safety, and a smartphone compatible stereo system for your favorite music.